ST. JAMES—Salem City Administrator Ray Walden began his duties as chair of the Meramec Regional Planning Commission’s (MRPC) Transportation Advisory Committee (TAC) at its Aug. 9 meeting. Walden from Dent County replaces John Casey of Washington County. Casey served two terms as allowed by the TAC bylaws. Other new officers included Mayor George Lauritson of St. Robert as the vice chair, and Darin Pryor with the city of Rolla as secretary. The committee then heard a presentation from Cyndra Lorey, executive director of the Rolla Regional Economic Commission, on Proposition D, a statutory ballot measure aimed at increasing Missouri’s fuel tax by 10-cents applied in 2.5 cent increments over the next four years. Like the current 17-cent fuel tax, the increase can only be used to fund Missouri state law enforcement and roads, bridges, streets and highways and is shared with cities and counties across the state. The current state’s fuel tax is 17-cents, which was established in 1996. If you adjust for today’s inflation rates, the 17-cent fuel tax is worth about 7-cents in 1996. Essentially, the 10-cent fuel tax increase is raising the state of Missouri back level with inflation costs. Missouri is currently ranked 49th in the nation on fuel tax and ranks 46th in the nation on revenue spent for transportation funding. With the 10-cent increase at the end of the four years, Missouri would be at 27 cents and comparable to surrounding states who all fall into the 20-30 cent range, excluding Oklahoma which is lower but has toll roads to supplement transportation funding instead. • Was reminded by Tipton that if applying for funding from MoDOT that one staff person must complete the Local Planning Agency (LPA) Certification Training. For example, counties with Bridge Replacement Off-system (BRO) projects must have a person who has a current LPA certification. Persons needing more information on MRPC’s Transportation Advisory Committee may contact MRPC at (573) 265-2993. The group will meet again at 4 p.m. Oct. 11 at MRPC, 4 Industrial Dr., St. James. Meetings are open to the public. Ray Walden of Dent County chairs the TAC. Formed in 1969, MRPC is a voluntary council of governments serving Crawford, Dent, Gasconade, Maries, Osage, Phelps, Pulaski and Washington counties and their respective cities. Washington County Presiding Commission Marvin Wright serves as chairman. A professional staff of 23 offers technical assistance and services, such as grant preparation and administration, housing assistance, transportation planning, environmental planning, ordinance codification, business loans and other services to member communities. 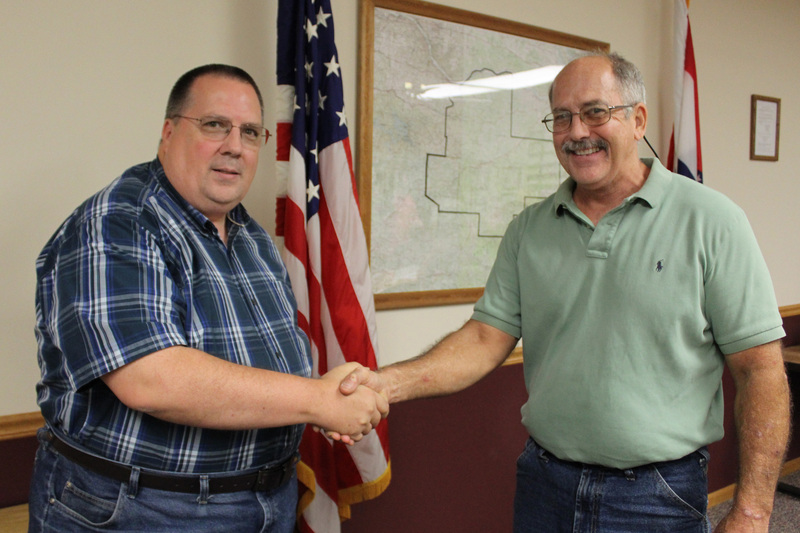 Cutline: Salem City Administrator Ray Walden (left) replaced John Casey (right) of Washington County as chair of the Meramec Regional Planning Commission’s Transportation Advisory Committee (TAC). Casey served two terms as chair as allowed by the TAC bylaws.